In her more than nine years on the bench, Las Vegas Justice of the Peace Melissa Saragosa has never faced an opponent when running for her Department 4 seat. 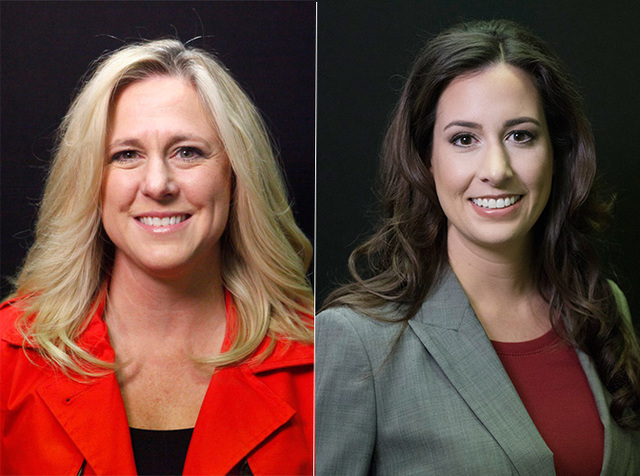 This year, she has two opponents — lawyers Amber Candelaria, who specializes in family law, and Jillian Prieto, a former staff attorney for Clark County District Court. Saragosa points to her experience in civil and criminal matters in Justice Court — where she has overseen the specialty Domestic Violence and Veterans Treatment Courts — and in her more than 20 years in the Air Force as an attorney, prosecutor and judge. She is a lieutenant colonel in the Air Force Reserve. Saragosa said her focus is to improve access to the courts for veterans with substance abuse or mental health problems and make Veterans Treatment Court an example for other courts across the country. She’s hoping to find funds to establish positions similar to probation officers, who could make home visits to participants in the veterans program and get them to detox or inpatient facilities when they need them. If given the chance, Candelaria said she could do a better job with veterans court than Saragosa. “We have a veteran on the bench, and I don’t know that she’s actually used those skills to increase access to justice or enhance justice in any way,” Candelaria said. Candelaria, who has experience as a child support hearing master, said becoming a judge has been her goal since graduating from UNLV’s law school and then receiving her bar license in October 2006. “I’ve always known that this was my path and this was my way to make a difference,” she said. In 2010, she tried to run for another Justice Court seat, but was denied a spot on the ballot because at the time she wasn’t a licensed lawyer under state law for five years. She lost her challenge in the Nevada Supreme Court. Prieto, who left the legal office of District Court two years ago, has been quiet on the campaign trail. She did not respond to email requests for interviews.